The critical question in the football players’ organizing effort is whether the athletes will be afforded the protections of the National Labor Relations Act (NLRA), meaning whether the universities could take action against them, such as revoking scholarships or enforcing penalties, because of their engaging in such activity, or would the federal labor law protect them against such a response? To have such NLRA protection, the athletes must show that they are employees. This is where the controversy lies. The NCAA has stated its position is an emphatic no. Although Northwestern has indicated it will seek review [from] the full board in Washington, that will not have the effect of putting a hold on the election. … That union election should go forward shortly. And the football players will vote. Those ballots are secret, and they’re sealed. They’ll be impounded by the board until the review is complete, and that could take a year. … The whole process could take a couple of years. One indicator [of what might result from bargaining between the players and the school] is what the union has said it wants to bargain for, and the number one thing I’ve seen is lifetime coverage of medical expenses resulting from football-related injuries or conditions. … But all that’s just a wish list. It’s all subject to bargaining. The implications of this decision are much debated but undoubtedly far-ranging. The New York Times ran a very interesting piece immediately after the ruling on “Putting a Price on Priceless.” and Wednesday this week the paper offered a “primer” on the subject. Our friends from the New York Employment Law Alliance firm at Bond Schoeneck & King in New York have blogged about a range of unintended consequences to which the NLRB ruling could lead. CAPA attempts to refute the likelihood of many such consequences on its website. On Wednesday, CAPA headed to Capitol Hill for scheduled meetings with lawmakers as the union braces for an appeal of the ruling. These meetings were expected to provide a chance for former Northwestern quarterback Kain Colter — the face of the college athletes labor movement — and Ramogi Huma, the founder and president of CAPA, to spell out one of their chief concerns, which is providing for the medical needs of athletes. Huma said the group also was concerned that the NCAA would lobby Congress to prohibit unionizing by college athletes. In a statement, Stacey Osburn, director of public and media relations for the NCAA, said Huma's concern was "unwarranted." 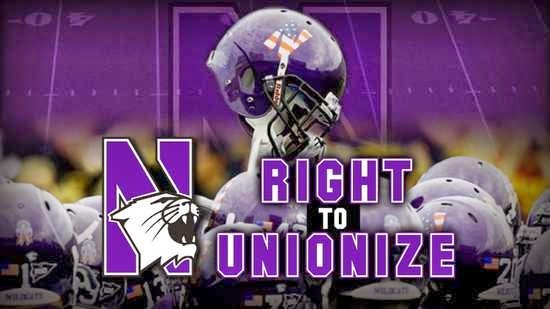 A Northwestern official has said that the students were not employees and that unionization and collective bargaining were not the appropriate methods to address their concerns. Not least among the issues raised by the NLRB ruling last week is what the proper analysis is, or should be, when deciding which members of a higher education community are employees with protected rights to unionize, bargain, and strike under the federal labor law. The NLRB is currently considering that question in a variety of contexts. In its 2004 Brown University decision, the labor board held that graduate students, research assistants, and proctors were not employees, but primarily students and thus were not afforded the protection of the labor law. There are many gray areas in this context. There is at least one that is more black and white, though: adjunct faculty clearly has a protected right to unionize; and with active support from SEIU’s Adjunct Action program they are aggressively doing that in a number of markets nationwide, including Minneapolis Saint Paul, as reported in the Star Tribune and the Twin Cities Daily Planet. Most employers in higher education should be taking action now to consider and plan for how they could be affected by this increasing and wide-ranging union activity on campus. Print this post Labels: Archives, Classification, Collective Bargaining, Higher Education, Labor and Unions, NLRB, Union Avoidance, Union Organizing.